She first came to the Valley as a young girl in 1849. 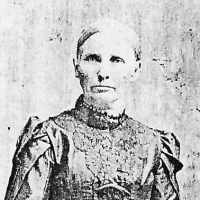 For some reason, years later, she returned east for a short time because she is seen returning to the Valley in the 1866 Holladay company with at least one of her sons. The Deseret News report of the company indicates she has two sons with her, but the original company roster only lists her and her son Levi. Journal History of The Church of Jesus Christ of Latter-day Saints, 21 January 1905, 2. "Mrs. Eunice Harmon is Laid to Rest," Emery County Progress, 28 January 1905, .